Earlier this week, a few days before the announcement of the Nobel Prize in Literature, you could put some cold hard pounds sterling on Alice Munro. You could drop a tenner on Hungarian novelist PÃ©ter NÃ¡das, or count on long-odds Norwegian Per Petterson to bring home the laurels. Though gambling on literary prizes is amusingly implausible to Americans, itâ€™s a time-honored tradition in the UK — and the betting runs particularly hot in the lead-up to the Nobel, with its approximately $1.5 million purse. The frontrunner, on Monday, was a perennial favorite: 81-year-old Syrian poet Adonis, who writes in Arabic and lives in Paris. Odds: 4:1. Second, at 6:1, was 80-year-old Swedish poet Tomas TranstrÃ¶mer, little known here despite being published in translation by several poetry powerhouses. Third, at 8:1: Haruki Murakami, a spring chicken at 62, the genuinely world-famous author of strange and wondrous novels including â€œThe Wind-Up Bird Chronicle.â€� His new book, â€œ1Q84,â€� will be published in English this month after selling millions of copies in his native Japan. In short, the favorites were more or less what youâ€™d expect: one prominent figure from a nation fighting for democracy, one crowd-pleasing literary novelist, and a Swede. Now, we Americans know how these things go. We know itâ€™s not going to be Philip Roth; itâ€™s always not Philip Roth. (Now that Iâ€™ve said that, heâ€™ll win next year.) We know, in fact, that it might be someone wholly unfamiliar. For every Doris Lessing, thereâ€™s an Elfriede Jelinek, the edgy Austrian novelist who did not even have an American publisher when she won in 2004. â€œMy moneyâ€™s on Olaf Unheardofsson,â€� my girlfriend said, after seeing the odds on Monday. And, in the end, she was right. As the announcement neared, however, a new frontrunner shot to the top of the list: Dylan. Not Dylan Thomas, a solid choice if he werenâ€™t dead. Bob Dylan. This made way less sense. Hereâ€™s the thing: I like Bob Dylan, although Iâ€™m more of an â€œoccasionally listens to â€˜Blood on the Tracksâ€™â€� fan than a â€œCheck out my complete collection of bootlegsâ€� fan. He is a brilliant lyricist, and one of the greatest living American songwriters. I would nominate him for the Nobel Prize for Songwriting in a second. But thatâ€™s the problem. Apologies to those still freaked out about his going electric, but Bob Dylan is a rock star. (Yes, he also wrote a fine memoir, â€œChroniclesâ€� — but the Nobel is for lifetime achievement, not a single book.) American rock stars should not annex the tiny number of international prizes allocated for writers of literature. All too often, those writers — of fiction, poetry, essays, plays — labor in obscurity, if not penury. The Nobel is one of the richest prizes, and one of the few (if not the only) to create an instant international readership. You have everything, rock stars! You can sell out Madison Square Garden! On a good day, poets can hardly fill ten folding chairs in a damp bookstore basement! Must you take this, too? 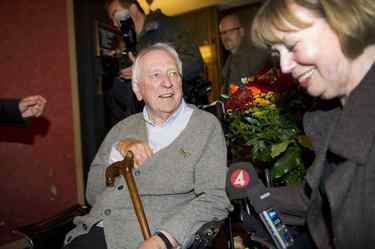 By choosing TranstrÃ¶mer, the Nobel committee declined to open this can of worms. Can you blame them? Iâ€™m all for reaching across disciplinary borders, but some categories do exist for a reason. Let Aaron Sorkin win an Academy Award. Let rock star Patti Smith win the National Book Award for nonfiction — but only because she wrote a really good nonfiction book. We donâ€™t need Nelson Mandela to win an MTV Video Music Award, or Lady Gaga to take home the Nobel Prize for Physics (although she sort of deserves it for her work in those Alexander McQueen shoes). Far better to recognize them for what they actually do. Let Bob Dylan win a Grammy, of all things. Let him sell out stadiums and see his records go platinum. And let Tomas TranstrÃ¶mer — who, after six decades of work, is no longer Olaf Unheardofsson anywhere there is international news — have a chance to be a rock star of literature. Amanda Katz is the deputy editor of Ideas and a former book editor. Follow her on Twitter @katzish. Reuters/Fredrik Sandberg: Tomas Transtromer at a news conference in Stockholm after winning the 2011 Nobel Prize in Literature.